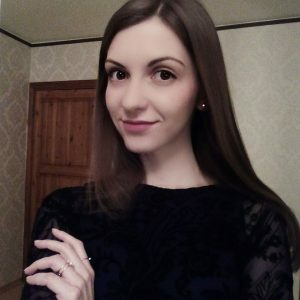 24socialnews.com is the PUP that uses misleading techniques to prevent removal. Use Reimage to locate malicious components and get rid of them faster than with uninstall instructions. A full system scan blocks virus reappearance and prevents traffic to malicious domains. 24socialnews.com is a deceptive search engine that might appear in your browser unexpectedly. Seeing this URL in your browser’s address bar indicates a browser hijacker type infection. Most of the time, users install such potentially unwanted programs (PUP) alongside spyware or untrustworthy freeware bundles that can be accessed via various file sharing sites online. Keep in mind that attempts to remove 24socialnews.com might not be successful. 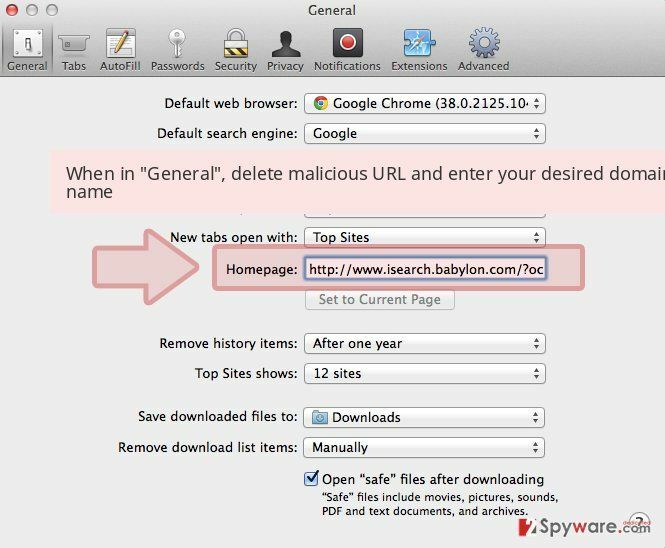 The hijacker aims to serve sponsored search results to users, so it does everything to stay on victim’s computer as long as possible. 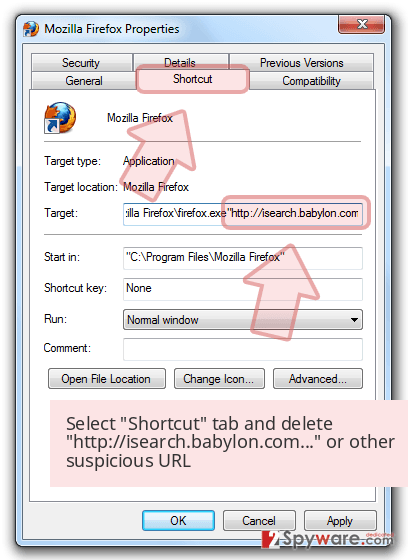 To ensure that it remains on the system and avoids detection, the hijacker may employ tricky techniques such as modification of browser shortcuts or usage of the AutoConfigUrl key. It goes without saying that since we cannot know the site’s practices regarding user data, we do not recommend entering any personally identifiable information into the described search engine. 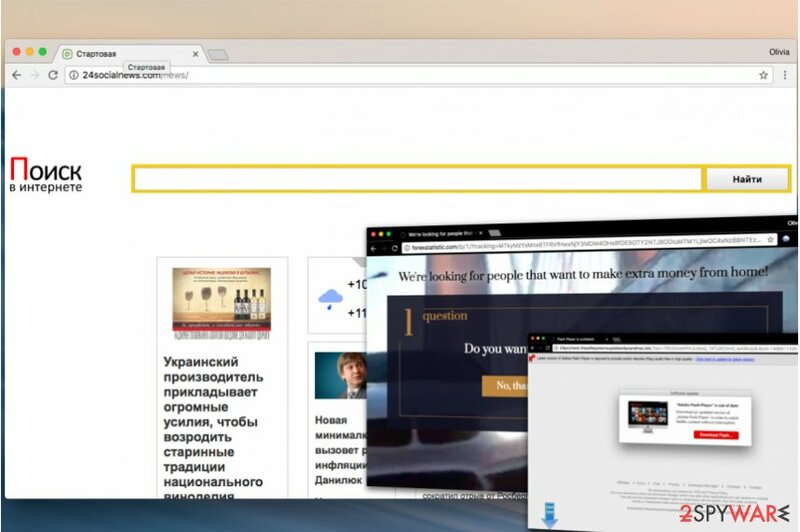 In general, the browser hijacker could be tracking your online activities, so stay vigilant and remove 24socialnews.com virus as soon as its search site pops in your browser’s URL bar. If you experience browser redirects or see annoying ads on your computer screen frequently, check for 24socialnews.com virus in your computer. It might be causing these issues for you. Browser hijackers that replace homepage and search engine settings in Chrome, Safari, Internet Explorer and other browsers typically serve ads containing links to external Internet sites. It must be said that trustworthiness of these pages often raise a lot of questions for security specialists. That can be explained by the ad-supported programs’ developers’ greed to earn pay-per-click revenue regardless trustworthiness of the ads they serve. If you care about your security, consider 24socialnews.com removal options we provide. There are two of them – the automatic removal option (using anti-spyware or anti-malware software) or the manual one, which requires user’s patience and reading lengthy instructions provided below this article. Are you tired of never-ending ads appearing in your browser? Then you should reconsider methods you use to install software downloaded from the Internet. Chances are, you tend to rely on installation settings offered by software installers, but what you actually need to do is to configure the installation settings the way you want. Otherwise, you will run into threats such as 24socialnews.net. Dieviren.de warns that potentially unwanted programs are on a rise and suggest taking actions to protect your PC against them. To set preferred installation settings and alter components of your download, pick Custom or Advanced settings for the installation. This way, you will access the list of extra items offered by the rogue software installer. 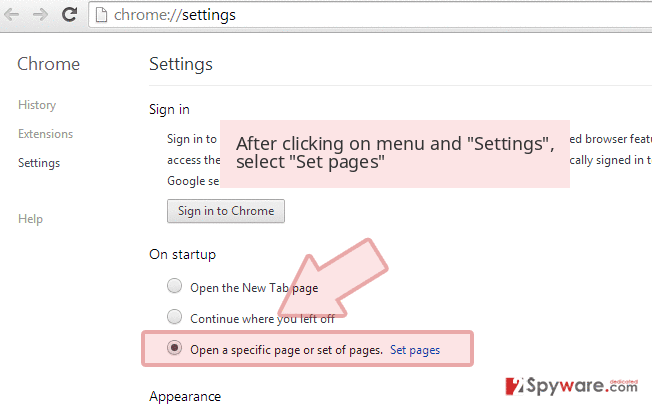 Make sure you deselect all options provided to you, including praised browser add-ons, search pages, applications, and others. These programs hardly can ease your life in any way. Vice versa, they will deteriorate your browsing experience by pushing sponsored content in different forms. 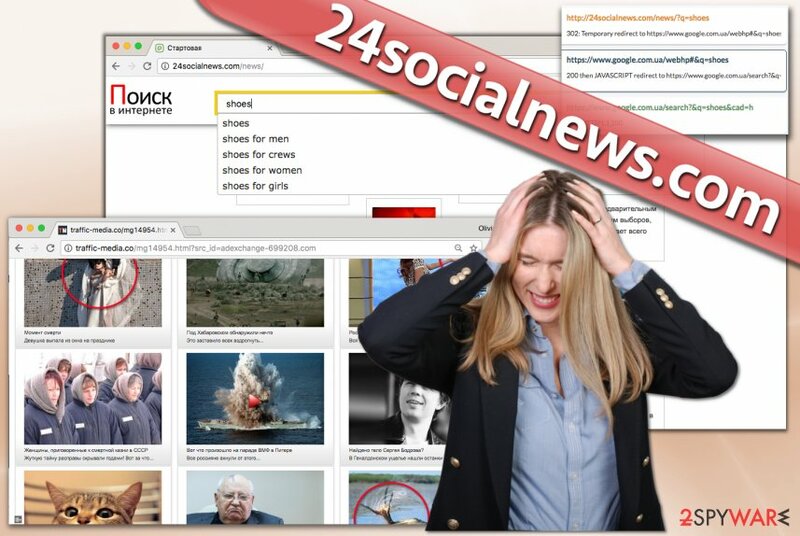 When choosing 24socialnews.com removal option, you should decide whether you are experienced enough to delete potentially unwanted programs manually. Those who had a chance to deal with a similar program before probably already know where to look for components of it. If you have never been lured into installing unwanted program unknowingly, then rely on guidelines provided below the article for a successful 24socialnews.com removal. Check for suspicious items in Control Panel using the guide with screenshots below. 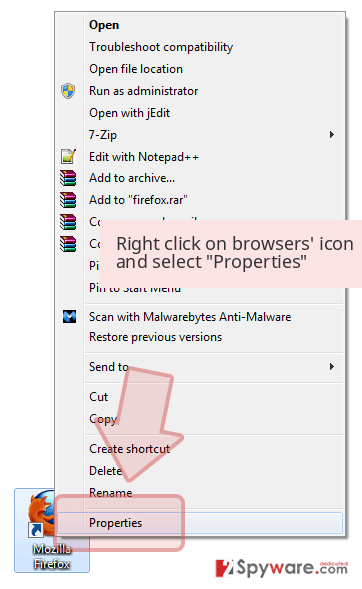 Please do not rush and read the provided instructions carefully because they explain how to fix compromised browser shortcuts. Completing the provided steps successfully guarantees 24socialnews.com virus removal. Here, look for 24socialnews.com or any other recently installed suspicious programs. Wait until you see Applications folder and look for 24socialnews.com or any other suspicious programs on it. Now right click on every of such entries and select Move to Trash. When in the new window, check Delete personal settings and select Reset again to complete 24socialnews.com removal. Once these steps are finished, 24socialnews.com should be removed from your Microsoft Edge browser. 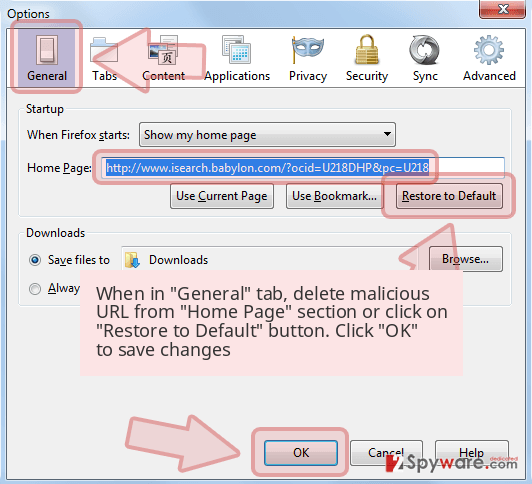 Firefox can be infected among other browsers installed on your PC, but if you follow provided guidelines attentively, you won't have any problems and delete the potentially unwanted program with ease. Here, select 24socialnews.com and other questionable plugins. Click Remove to delete these entries. Now you will see Reset Firefox to its default state message with Reset Firefox button. Click this button for several times and complete 24socialnews.com removal. Reset Chrome to clean unwanted add-ons and fix unexpected changes in settings that were implemented by the described 24socialnews browser hijacker. Here, select 24socialnews.com and other malicious plugins and select trash icon to delete these entries. Click Reset to confirm this action and complete 24socialnews.com removal. Here, select Extensions and look for 24socialnews.com or other suspicious entries. Click on the Uninstall button to get rid each of them. Here, look at the Homepage field. If it was altered by 24socialnews.com, remove unwanted link and enter the one that you want to use for your searches. Remember to include the "http://" before typing in the address of the page. Now you will see a detailed dialog window filled with reset options. All of those options are usually checked, but you can specify which of them you want to reset. Click the Reset button to complete 24socialnews.com removal process. ^ Unexplained Windows or software behavior may be caused by deceptive software. Microsoft Support. Get Help Regarding Microsoft Products. ^ DieViren. DieViren. Security and Spyware News, Malware Removal Guides. This entry was posted on 2017-10-26 at 12:42 and is filed under Stealing programs, Viruses. You can quickly scan the QR code with your mobile device and have 24socialnews.com virus manual removal instructions right in your pocket. How did you remove 24socialnews.com virus?